HTC plotting to compete with Galaxy S4? Greek site TechCommunity.gr [Google translation] is under the impression that a One refresh is on the way, and with the new processor the critically acclaimed handset will also see its memory bumped up to 3GB RAM. The report features a purported screenshot from the phone's hardware settings, apparently showing the improved specifications, but it's hard to verify its authenticity. According to the site, the updated version of the handset will bring 'Clear Audio' tech for improved call and music quality, but aside from that the rest of the handset's features will remain the same. HTC is no stranger to updating its phones throughout the annual cycle, but to give the HTC One a processing bump at this stage would be a pretty big surprise. If the company is indeed working on an octa-core device to rival the Samsung Galaxy S4 (in some regions) then it would appear more likely that HTC will save it up for the One's successor. It would give HTC a top-line spec improvement to hang the new handset on and would avoid annoying owners of the current handset, who may wonder why an update arrived after just six months on sale. Oh, and while we're on the subject of the One's successor, if it isn't called the HTC One-Two then its a missed opportunity. 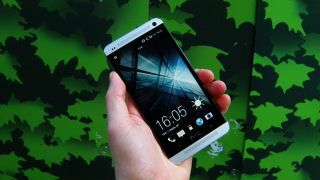 Video: TechRadar presides over the meeting of the HTC One and its baby brother, the HTC One Mini.